The Lazy Bantha is a Correllian YT-2400 that Dr. Dev won in a game of Sabaac. He thought it was quite a catch until he tried starting it up. Only then did he learn that this very pretty and polished ship came with a long list of issues. Despite the fact that this hunk of bolts can barely stay in the sky, it is the ship that the party calls home. Did you make this yourself? Pretty cool stuff. If you did, what software did you use? I did. It was a combination of Adobe Photoshop and Illustrator. I wasn’t very satisfied with other deck plans for this ship – most I found used every inch of space as if there was no ship there or had odd choices like the passenger quarters where the engine was while the engine room was off to the side. I used the Falcon’s plans as a starting point and went from there. Solid bit of graphic design Michael. That being said; riddle me this, where did you get the assets to make this lovely interior? Did you make them yourself or pick them up from a 3rd party? If you picked them up from a 3rd party, where from? Because this is a very cool idea and I’d very much like to try and give this a go myself! The plans were a combination of free assets I found online (I can’t remember where from at the moment) with a few simple ones I put together myself in Illustrator. The general shape and floorplan was done in Illustrator, and then moved to Photoshop to apply the textures. 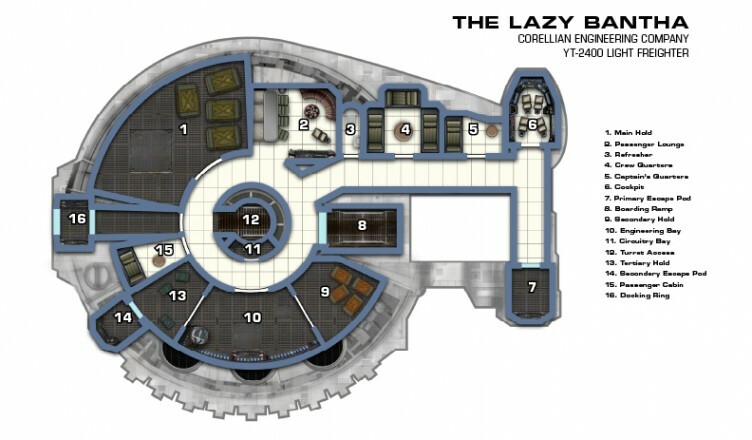 I just want to say thanks for putting together a YT-2400 layout that makes sense. Awsome! Thank you for putting this together and sharing. Any chance you might be working on some more ship plans? We’d only do that if the party started using a different ship. And we all know that nothing is ever going to happen to the Bantha. Any way that you would be willing to shoot me over a high res psd file for the Bantha? I’d love to be able to print it out large enough to be a working “battle mat” if needed, but the PDF version gets way too pixelated! Hello there! This design is simple yet a very effective one for the YT. I too would be very interested in a higher resolution version that I could print for my group. I noticed the file name here is LazyBanthaSmall, so I’m hoping it wouldn’t be too much trouble to share if it’s saved in a larger size. Love the work, it’s beautiful! Fantastic set of plans! They make a lot more sense than the Shadows of the Empire interior for the Outrider! I was wondering though what the logic was behind making the turret access point away from all the areas where crew would normally be. Wouldn’t it have made more sense to have it pointing toward the cockpit or the boarding ramp for quick access? Be notified by email when we post new material. Star Wars Edge of the Empire, Age of Rebellion, and Force and Destiny Talent Tree PDFs – Edge of the Empire now Complete! Alicja - Star Wars Edge of the Empire, Age of Rebellion, and Force and Destiny Talent Tree PDFs – Edge of the Empire now Complete! Nice respond in return of this query with firm arguments and telling the whole thing about that. Fantastic site. Plenty of useful information here. I am sending it to a few friends ans also sharing in delicious. And of course, thanks for your effort! Claude Sabella - Star Wars Edge of the Empire, Age of Rebellion, and Force and Destiny Talent Tree PDFs – Edge of the Empire now Complete! I use them in every session. Many thanks for this. Do you think such cards would make sense for disease symptoms, too?